Carry out the necessary preparations and inspections before driving the vehicle in winter. Always drive the vehicle in a manner appropriate to the prevailing weather conditions. Use fluids that are appropriate to the prevailing outside temperatures. Have a service technician inspect the condition of the battery. Have the vehicle fitted with four snow tires or purchase a set of tire chains for the front tires. Ensure that all tires are the same size and brand, and that chains match the size of the tires. do not try to forcibly open a window or move a wiper that is frozen. Pour warm water over the frozen area to melt the ice. Wipe away the water immediately to prevent it from freezing. To ensure proper operation of the climate control system fan, remove any snow that has accumulated on the air inlet vents in front of the windshield. Check for and remove any excess ice or snow that may have accumulated on the exterior lights, vehicle's roof, chassis, around the tires or on the brakes. Remove any snow or mud from the bottom of your shoes before getting in the vehicle. Accelerate the vehicle slowly, keep a safe distance between you and the vehicle ahead, and drive at a reduced speed suitable to road conditions. Park the vehicle and move the shift lever to p without setting the parking brake. The parking brake may freeze up, preventing it from being released. If necessary, block the wheels to prevent inadvertent sliding or creeping. Use the correct tire chain size when mounting the snow chains. Chain size is regulated for each tire size. Regulations regarding the use of tire chains vary depending on location and type of road. Always check local regulations before installing chains. install and remove tire chains in a safe location. Install tire chains on the front tires. Do not install tire chains on the rear tires. Install tire chains on front tires as tightly as possible. 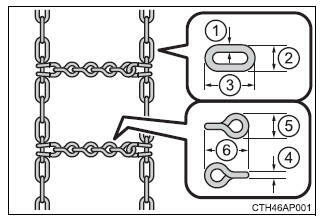 Retighten chains after driving 1/4 �o 1/2 mile (0.5 �O 1.0 Km). Install tire chains following the instructions provided with the tire chains. Failure to do so may result in a loss of vehicle control and cause death or serious injury. Use tires of the size specified. Maintain the recommended level of air pressure. Do not drive in excess of 75 mph (120 km/h), regardless of the type of snow tires being used. Use snow tires on all, not just some wheels. Failure to do so may result in the vehicle being unable to be driven safely, and may cause death or serious injury. Do not drive in excess of the speed limit specified for the tire chains being used, or 30 mph (50 km/h), whichever is lower. Avoid driving on bumpy road surfaces or over potholes. Avoid sudden acceleration, abrupt steering, sudden braking and shifting operations that cause sudden engine braking. Slow down sufficiently before entering a curve to ensure that vehicle control is maintained. Vehicles with lda (lane departure alert) system: do not use lda (lane departure alert) system. Request repairs or replacement of snow tires from toyota dealers or legitimate tire retailers.